Contouring may seem like it suddenly appeared from nowhere in 2010 when Kim Kardashian shared that photo! That photo started a phenomenon that would change the everyday makeup routines of those of us who were not celebrities or were not makeup artists. We could attempt to get the chiseled cheeks of celebrities ourselves! 6 years later and contouring has exploded! Clown contouring, sugar skull contouring, strobing, colour correcting, puzzle contouring, and even body and lip contouring have become a favourite of bloggers and vloggers alike. But how and why did we begin this quest for bigger and lusher cheeks? Why Are We Obsessed With High Cheekbones & Full Cheeks? Like most things it all comes back to nature and instincts. Having high cheekbones is said to be a sign that women have reached maturity and can reproduce! Much like where full lips are a sign of fertility it all comes back to the caveman days, as we get older women’s cheeks tend to dip and our lips become thinner this can however be fixed using cheek filler or lip filler. High cheekbones in men are also said to be a sign of high testosterone! So although we may not know it our standards of beauty are still reflective of 1000’s of years ago when we were searching for a mate! How Did Cheek Contouring Come About? Contouring your face with makeup has been an insider secret for years until Kim and social media gave it to the public. However it goes goes back as far as the 1400s when stage actors would use soot on their faces so their audience could see their expressions better! In the 1800s artificial lighting was invented so they then moved on to pancake makeup, (at the time only performers or prostitutes wore makeup!). Rather than the the painfully time consuming act of daily contouring many of us chose to go for something more reliable and time saving. Today we have our modern and safe Hyaluronic Acid cheek fillers such as Juvederm but getting these cheeks goes as far back as 1893! In 1893 the first cheek implant was recorded! This was done by removing fat from an arm and placing it directly into the cheek, this practice is still done today in many places.. In the 1940’s and 50’s silicone was used but as it was causing many side effects it was banned until 1992 when a new safer form of silicone was created! You’ve probably heard horror stories about collagen in cheek fillers and lip fillers causing that swollen and fake look of the 80’s and 90’s. Collagen fillers were actually made of animal products such as bovine and were available as implants and injections. 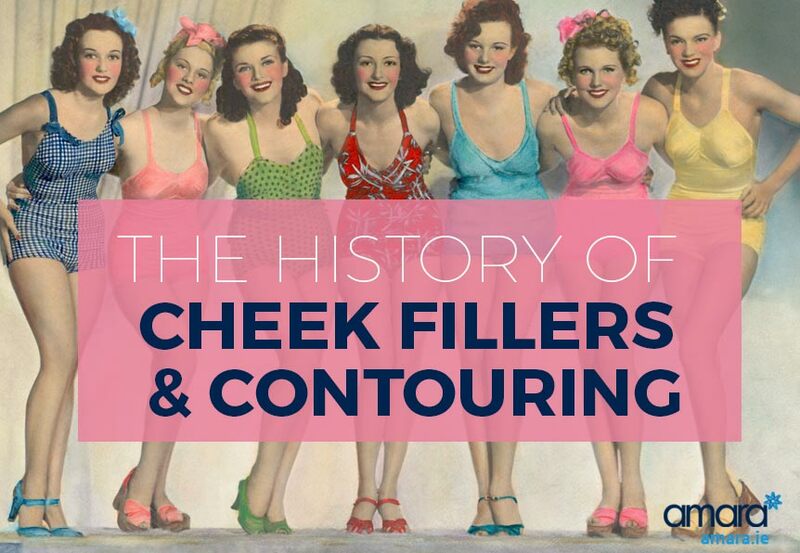 In the 2000’s the new and safer Hyaluronic Acid cheek fillers were approved! Now today we have a natural and safe and proven option of injectable cheek filler such as Juvederm. Do you contour your cheeks everyday? Why not book in for a consultation at Amara to see what treatment could be right for you? !